is Halloween Cocktail #6 of 31 Monstrously Marvelous Martinis! Halloween cocktail #6 is The Brain Pickle Martini. Yes, pickle. I don't know what you're cringing about, it's really pretty good if you like dill pickles or the dill herb. If you're a fan of Dirty Martinis which use olive juice as a mixer you might just enjoy this cocktail. 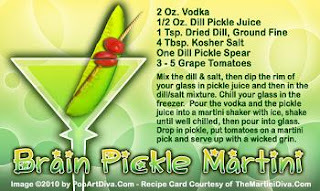 Besides, what could be spookier than a big slice of dill pickle garnish? Drink too many and it's what happens to your brain as well. That spooky enough for ya? Download the FREE, 5x3 recipe card in print quality HERE .